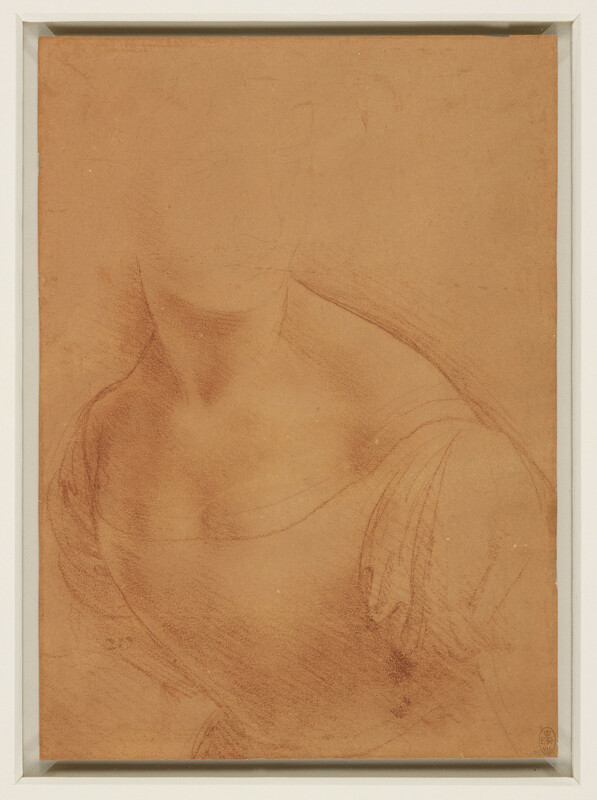 A study of the bust of a woman seen to the waist, the head indicated in outline, the rest modelled in red chalk. She is turned slightly to the left, and is leaning slightly forwards, with her head turned to the right. Melzi's 217. This is a study for the bust of the Virgin in a composition known as the Madonna of the Yarnwinder. The drawing is executed in Leonardo’s distinctive technique of red chalk on paper coated with a delicate pale red preparation, itself probably composed of ground red chalk. The facial features of the Madonna can just be discerned, outlined in metalpoint. The drawing is some way from the painting in both pose and drapery, and the line of the back is particularly unsatisfactory. The Madonna of the Yarnwinder was painted for the secretary to Louis XII of France, Florimond Robertet, whom Leonardo may have met in Milan in late 1499. Several versions of the painting survive; the finest was probably executed by Leonardo in collaboration with assistants, as was common in Renaissance workshops.